Marcelle Fozard is the proud owner of American Road Trip Gallery located on Studio #15 on the Arts Walk here in Brookland. Here she displays and sells a variety of upcycled items, including pennants, pillows, suitcases, earrings, soaps, rings, paintings, and more. Fozard opened the gallery three years ago after pulling back from her role as a stay-at-home mom. As a lover of all things vintage, fun, and adventure, the artist loves her space as this is her first experience owning a gallery. She loves being a mom, but as she says, “every mom needs some ME time!” Fozard actively transforms old items into new pieces of art. For example, when she finds vintage pennants, which she considers pieces of art in and of themselves, she will transform them to be used in pillows, a more useful and comfortable household item. Fozard is also a proud rooster owner. Therefore, she is quite fond of art depicting roosters and chickens, and on her website (www.marcellefozard.com) she has a gallery of “chicken icons.” These include, but are not limited to, a vintage pulp fiction chicken, a Dia de los Muertos chicken, and a Chicken Betty, which is “currently roosting at Roscoe’s Pizza in Takoma Park,” she pointed out. Fozard made all of these items, and they are all made from upcycled objects! This spring semester, Catholic University freshman Amanda McShane, a Studio Art major and intern at the gallery, will work with Fozard herself and a collection of friends on a larger project. Their mission is to transform a donated car, a white Subaru Forester, into an “art car” like a clean canvas! Creating one of these pieces of “art on the road” has always been one of Fozard’s dreams, according to her, as she has been inspired over and over again by popular events like the Houston Art Car Parade and the thriving art car scene near her newly opened gallery in Baltimore, Maryland. Now, Fozard will finally have the opportunity to turn her car into a real rooster, complete with feathers on the inside, and more durable, decorative materials on the outside. For those interested, the gallery is currently open to the public in the Arts Walk on Saturdays, Tuesdays, and Thursdays, and will be increasing its open hours as the weather becomes warmer in the spring months. 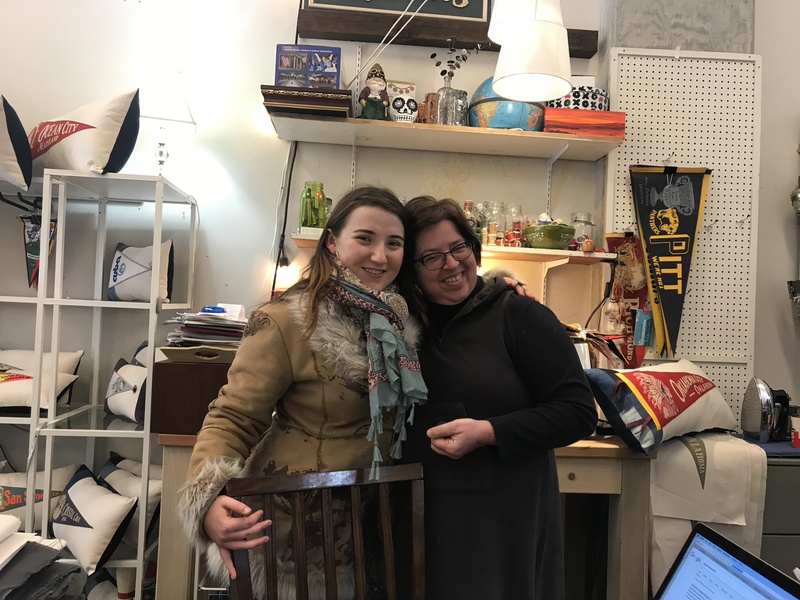 In the meantime, Fozard is an active participant in the Brookland Monroe Street Farmers Market which opens at 9 AM on Saturdays starting in the spring, where her work will also be on full display. McShane and Fozard will continue working on their art on the road project for a future debut.